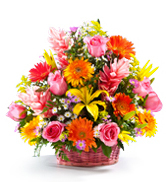 Send flowers to Uruguay the same day your order them at daFlores. From Happy Mother's Day to birthday greetings and get well wishes, we'll send your loved ones the best flower arrangements and gift baskets available. To send flowers to Uruguay and receive same day delivery, just order your bouquet before 2pm, Uruguay time. With daFlores.com, your flowers are always beautifully prepared by a Uruguay florist for fresh and fast delivery. About half the people of Uruguay live in Montevideo, so of course we have florists in Uruguay there. We personally visit our international florists to ensure they commit to our high standards -- each has been in business a decade or more, and each uses fresh flowers every morning. But it goes further than that -- we only work with one florist in each major metro or neighborhood, ensuring they remain completely focused on you, the customers. When you send flowers to Uruguay, we want you to know we have your back. In some ways Uruguay is a kind of utopian place to live, with a high standard of living, beautiful scenery and a commitment to civil rights. Early settlers brought in cattle and Uruguay had strategic importance during the Napoleonic wars, but all that is history now. 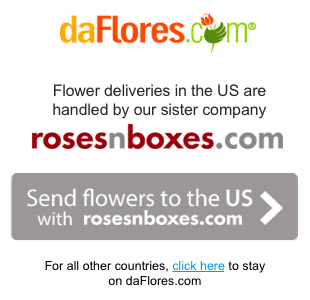 As you can see, when you send flowers to Brazil, Uruguay or any other country with daFlores, we always have your back. Our florists in Uruguay are simply the best, and their passion for the craft reflects ours too. 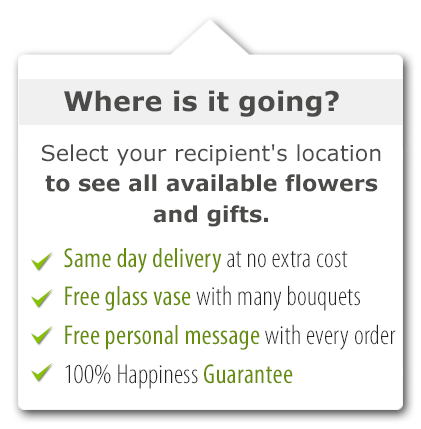 With same-day delivery available in most cases – just order by noon local time in Uruguay – it's quick and easy to set in motion your flower delivery in Uruguay. Same Day Flower Delivery to all cities in Uruguay. Para ver esta página en Español, favor visitar nuestra página de Enviar Flores a Uruguay.